Bond valuation is the process of determining the appropriate price to pay for a bond. A bond’s value is based solely on it’s future cash flows. Therefore, the first step in the fundamental analysis of a bond is determining the present value of all future cash flows. The sum of those values is equal to the present value of the bond. This process is called discounting. The discount rate is the rate of return which you, as an investor, demand for owning the bond. It turns out that price is paramount in bond valuation. A bond’s future cash flows are fixed. Therefore, the only way to increase your rate of return, is to lower the price you pay for the bond. I will present two examples to explain how the price you pay for a bond changes the rate of return you will achieve on your investment. 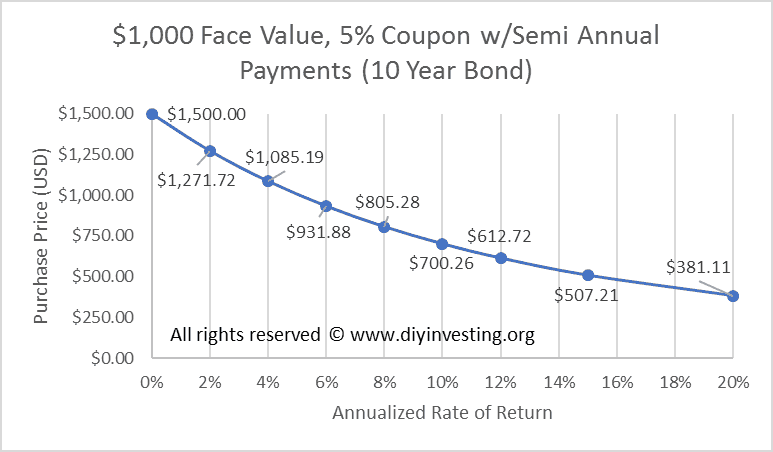 First, we will discuss a $1,000 face value zero-coupon bond that matures in 10 years. Second, we will discuss a $1,000 face value, 5% coupon bond with semi-annual payments that matures in 10 years. First, let’s discuss terms. The bond in this example matures in 10 years. Therefore, the face value amount of $1,000 will be paid back 10 years from the date of purchase. Also, zero-coupon bonds make no interest payments until they mature. The only cash flow you are purchasing is the future payment of $1,000 in 10 years. I’ve shown the cash flows for this bond in the chart below. So how much should an investor pay to purchase this bond? That depends on what rate of return they want to earn on their investments. A bond valuation based upon a 6% rate of return would mean a purchase price of $675.56. Meanwhile, a bond valuation based upon a 10% rate of return would require a much lower purchase price of $385.54. I’ve included the whole chart of the price to rate of return relationship for this bond below. As you can see, the price you pay for the bond drastically effects the rate of return that you’ll earn. If you pay the full $1,000 you’d earn 0% on your money for the 10 year period. However, you start to earn a positive return as your purchase price drops lower and lower. On the other hand, if you were to pay more than $1,000 for this bond, you’d end up losing money. Some government savings bonds function as zero-coupon bonds. Therefore, it’s important to pay attention to the price you pay for these bonds. Unlike the previous example, this bond will make regular interest payments. With a $1,000 face value and a 5% coupon rate, the owner will receive $50 per year in interest over the course of 10 years. The interest is paid twice a year in $25 increments. In the last year, you’ll receive an interest payment and the $1,000 face value principle payment. I show the cash flows for this bond in the chart below. Valuing this bond is a little bit more difficult. You have to discount ten years worth of cash flows for a total of twenty cash flows. I’ve done the math for you though. In this case, a bond valuation seeking a 6% rate of return would require a purchase price of $931.88. You’ll notice that this is much more expensive than the previous example, for the same rate of return. This difference is due to the value of the consistent stream of interest payments you receive over the course of the ten years. The chart below demonstrates the price to rate of return relationship. Once again, a lower price leads to higher rates of subsequent return. Everyone has different circumstances. These differing circumstances mean that successful investing equates to a different rate of return for each of us. However, once you know what return you need, you simply buy bonds at the price needed to provide that return. One of the most commonly owned bonds in the world are United States 10-year treasury bonds. This example is the exact format in which treasury bonds function. They last for ten years and make semi-annual payments. If you understood this example, you are now equipped to understand the basic pricing structure of US Treasury Bonds. There are three main takeaways from this article. The first and most important lesson is that the lower the price you pay for an investment, the higher the return you will earn. This concept should be at the forefront of your thoughts every time you purchase an investment. Lower prices equal higher returns, and higher prices equal lower returns. This axiom always holds true, all else equal. Bond valuation is derived solely from the present value of it’s future cash flows. You can precisely calculate the future return of a bond, based solely upon the purchase price. If you like or found value in this content, please consider sharing it or posting a comment so that others may find it as well.